The ICT Research & Consulting’s 2017 survey on SNS user trends reveals that Japan’s active users of SNS are 68.8 million (as of the end of 2016), accounting for 68.9% of all (99.8 million) Internet users in Japan. 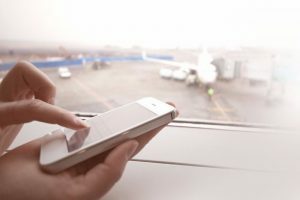 It suggests that this number may reach 72.2 million by the end of 2017, meaning a net increase of 3.38 million a year or about 280,000 users every month on average. 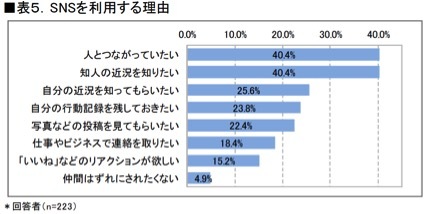 The number of SNS users in their 40s or 50s has increased. 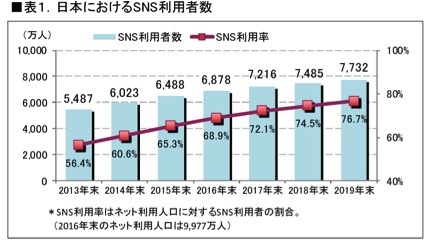 If the current trend continues, the number of SNS users in Japan should reach 77.3 million by the end of 2019, accounting for 76.7% of all Internet users in Japan. The questionnaire survey conducted by ICT Research & Consulting in October 2017 shows that 83% of all 4,196 respondents answered that they use SNS or phone/mail apps as communication tools. The most popular SNS app was LINE (76.9%), followed by Twitter (41.2%), Facebook (32.7%), Instagram (28.6%), Google+ (9.2%), Skype (9.2%), and mixi (6.2%). Compared to last year, the usage rates of LINE, Instagram and Twitter increased, especially that of Instagram (from 22.1% to 28.6% this year). The most satisfactory SNS app was LINE (77.9 points), closely chased by Instagram (77.7 points) and followed by Twitter (74.0 points), Google+ (69.0 points), Skype (68.7 points), and Facebook (66.5 points). Regarding the time spent on SNS, 41% of the respondents answered that they spent more time on Line than a year ago; the share was 58% for Instagram and 43% for Twitter. Interestingly, the increase in time spent by users of LINE, Instagram and Twitter correlates with the penetration of smart phones, while the time spent on PC-based Facebook does not increase as much. 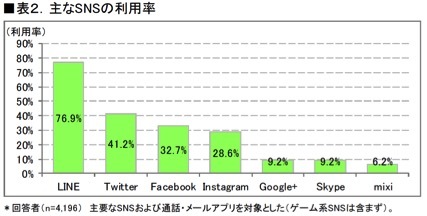 The ratios of users spending an hour or more daily on SNS were: 33% for LINE, 38% for Twitter, 29% for Instagram and 15% for Facebook. 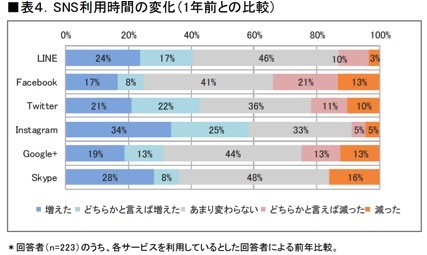 The main reason for using SNS is communication: more than 40% “To keep contact with people” or “To know what friends are doing”. High ratios were found for showing off e.g. “To let people know what I am doing” (26%), “To record what I did” (24%) or “To get reactions such as LIKES” (15%).